New from Flexicon is a Twin Bev-Con Flexible Screw Conveyor system with a common hopper and mobile base constructed and finished to sanitary standards. Ready to plug-in and run, the self-contained system can fill two vessels with the same material simultaneously. Mounted on a frame with locking castors for in-plant mobility, it can be utilised in multiple locations, and rolled to a wash-down booth. 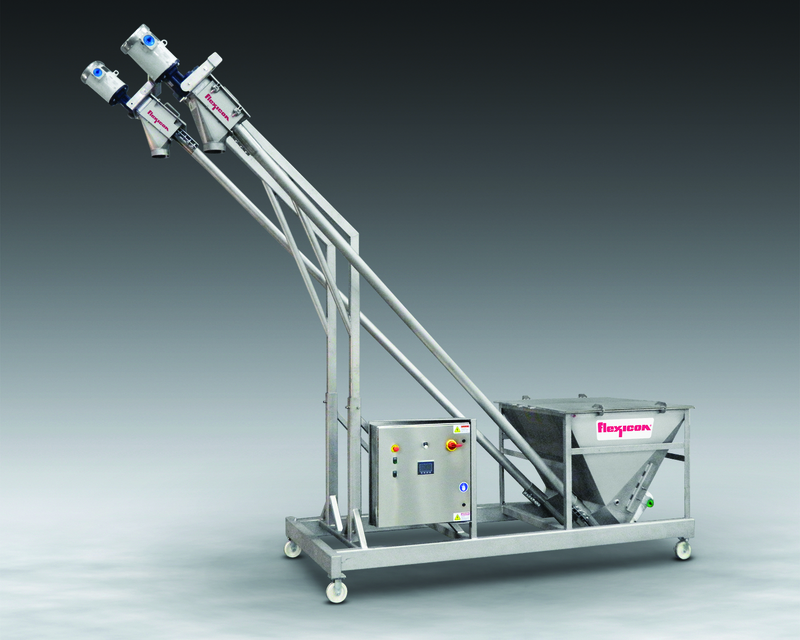 The hopper is equipped with dual discharge adapters, each of which charges a Bev-Con flexible screw engineered to move free- and non-free-flowing bulk materials that pack, cake, smear, fluidise, compress, or are otherwise problematic to convey. As material is conveyed, rotation of the screws causes them to self-centre in the polymer conveyor tubes, eliminating or minimising contact with the tube wall, preserving material integrity. The rolling action of material also prevents the separation of blended products comprised of disparate sizes, shapes and bulk densities. The screws are the only moving parts contacting material, and are driven beyond the point at which material is discharged, eliminating wear and contamination related to product contacting seals and bearings. Discharge housings of the conveyors are supported by dual booms cantilevered from the mobile base, allowing discharge of material into processing equipment or storage vessels up to 3.5m above the plant floor. The hopper has a capacity of 550 litres, and is designed with a steep back wall and diametrically opposed side walls skewed to form a trapezoidal area, the divergent angles causing non-free-flowing material to topple into the conveyor charging adapters. The unit is constructed of 316 stainless steel, and features sanitary quick-release clean out caps, quick-disconnect discharge box access covers, wash-down motors, and a stainless control panel with stainless conduit and liquid-tight compression fittings that permit wash down during changeovers and/or when conveying of corrosive materials. HMI controls allow manual and automatic start/stop and speed adjustment. Making progress on reliable flow?